Sending Firetrucks For Medical Calls : Shots - Health News Chicago's fire department gets 20 times more medical calls than fire calls, but it has twice as many firetrucks as ambulances. Other cities also face this disparity and there are calls for change. 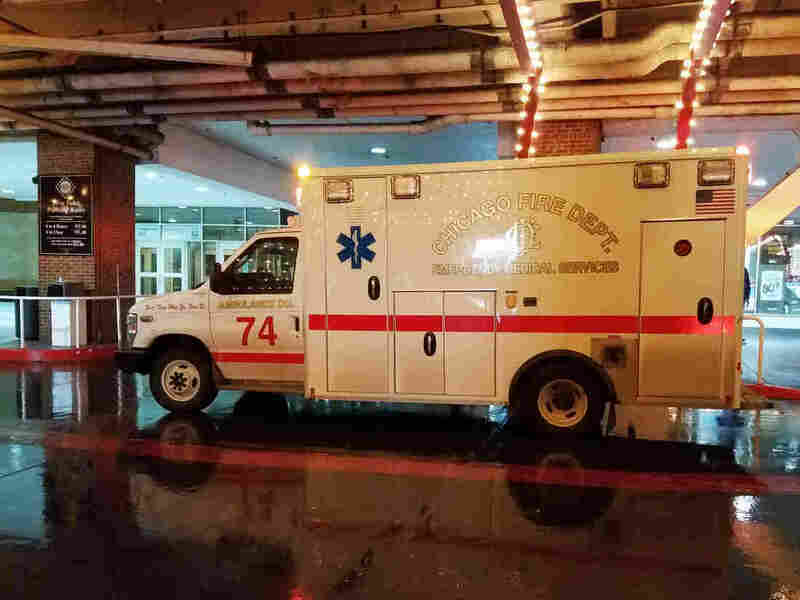 Chicago's Fire Department has only half as many ambulances as it has fire vehicles, but it gets 20 times more medical calls than fire calls these days. Let's say you think you're having a stroke and you call 911 for an ambulance. In a lot of cities across the country there's a good chance that a firetruck — with a full fire crew including a paramedic — will race to your door. But that doesn't mean they can deliver the emergency care you might need. In Chicago, like many cities, the fire department oversees both firefighters and paramedics who work on ambulances. When a medical call comes in, dispatchers usually prefer to send ambulances. But there are half as many of those as there are firetrucks. And fire department spokesman Larry Langford says those ambulances can be super busy. "They'll hit the street at 7 o'clock in the morning and may not come back to the firehouse at all until 7 o'clock the next morning," he says. Meanwhile, firetrucks are often much less busy and parked in firehouses, just minutes away from any given emergency. So the 911 dispatchers make a choice. 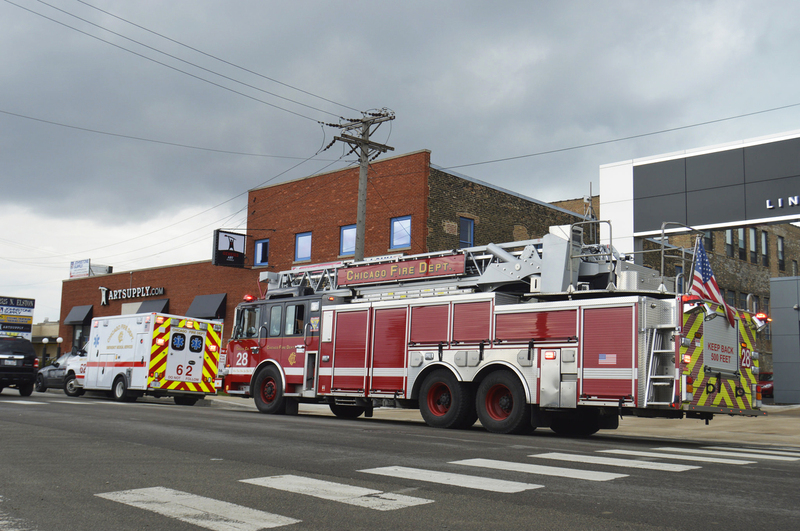 A Chicago Fire Department ambulance and firetruck respond to a call in 2016. "They save valuable time by sending the closest vehicle, which is usually a firetruck that has at least one paramedic and a lot of equipment on it," Langford says. That sounds logical until you ask why Chicago's fire department still has twice as many firetrucks as ambulances, especially when the department gets 20 times more medical calls than fire calls. Getting answers can be difficult. That has a lot to do with the political power of fire departments and their unions — and the challenge of trying to change that. Chicago's not alone in facing these challenges. Most cities are seeing big drops in fire calls and big jumps in medical calls. But few are really reforming their departments to meet this changing emergency landscape. Portland State researcher Phil Keisling thinks that's a mistake. He looked at why fire departments don't just admit that they're mostly medical services these days. "And I keep getting answers that are really not a whole lot more than, 'Well, that's the way we've always done it,' " he says. Keisling says that's not a good answer "in a world that has limited resources and you want to try to optimize the resources you've got." As more cities see the drawbacks of using giant firetrucks for medical issues, they're facing calls for reform. That's what Misty Bruckner found when she researched the problem at the Public Policy Center at Wichita State. While she didn't find agreement on everything, she said there was some consensus. "I think everybody can agree that the ladder truck responding to someone who may have a sprained ankle is not the best use of our public resources," she says. Langford disagrees. And he thinks people shouldn't get so hung up on what kind of vehicle arrives. He's even got a catch phrase for it: "Don't look at the conveyance. Look at the care." Catchy or not, the conveyance can matter. Firetrucks aren't equipped to take you to the hospital. Only ambulances are. And this transport part can be crucial, according to veteran Chicago paramedic Rich Raney. "When you get a stroke patient or a trauma patient, the most important thing is that they be transported to the hospital as quickly as possible," he says. "As they say with stroke patients, time is brain, basically." Each city runs its emergency services differently, so solutions are going to vary. In Chicago, for example, paramedics want more ambulances and staffing. New York and Wichita recently started deploying medics in SUVs for less urgent calls. And Washington, D.C., is trying something called nurse triage lines. They let callers talk through their problems with a nurse on the phone. But Keisling says some proposals should also look at moving resources from large firefighting staffs. "And it's not anti-firefighter, it's not anti-union, and it's not anti-government," he says. "It's just, why aren't we taking limited resources and deploying them in a smarter way?" While there's no agreement on exactly what that smarter way is going to be, most agree it doesn't involve sending a firetruck to treat someone with heartburn. Monica Eng is a reporter with NPR member station WBEZ. You can follow her @monicaeng.